I was ever so excited to be invited to review my choice of personalised skins from Wrappz. Wrappz has a variety of skins from laptops, phones, tablets, to game consoles. They can wrap anything with your choice of personalised skins and cases. I chose a MacBook Air Skin for my laptop. I am a huge fan of personalising anything I can, so I opted to do a collage for my skin. Wrappz offers a whole ray of pre-made designs that you can choose from and alter to your liking too! Their editing tools, and fonts are vast and user friendly. It only took me a few minutes to choose the pictures I wanted and make a little collage. 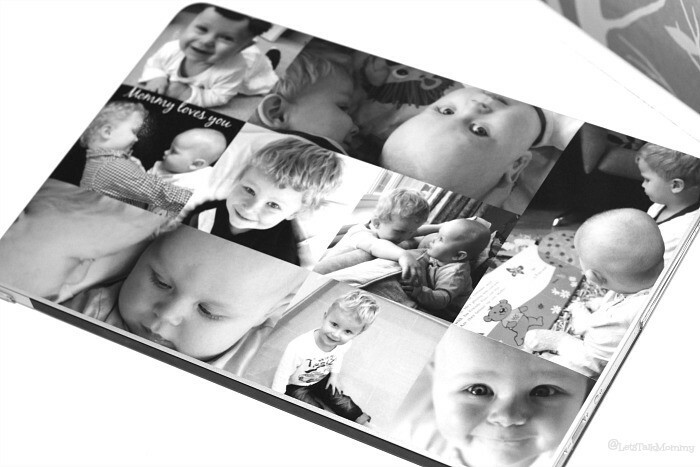 I opted for a entire black and white collage, I find black and white is so timeless. The cropping tools were so easy to manoeuvre as I wanted squares and rectangles both landscaped and horizontal. I also wanted to add text to part of it, so simple. Most companies limit how much you can tweak and change the appearance, size and shape of your pictures when putting them on cases or skins. I was really impressed how much I could do, click here to see for yourself. Delivery was quick and flawless, as it arrived in a hard ‘Do Not Bend’ envelope. I was ever so excited to see how bright and clear the photos printed. The glossy finish made it look fantastic. It was very easy to peel back and place on the back of my laptop. I also liked how thin it is, you can’t tell there is a skin on the back. It looks like it is part of the laptop case itself. It’s your lucky day, too! 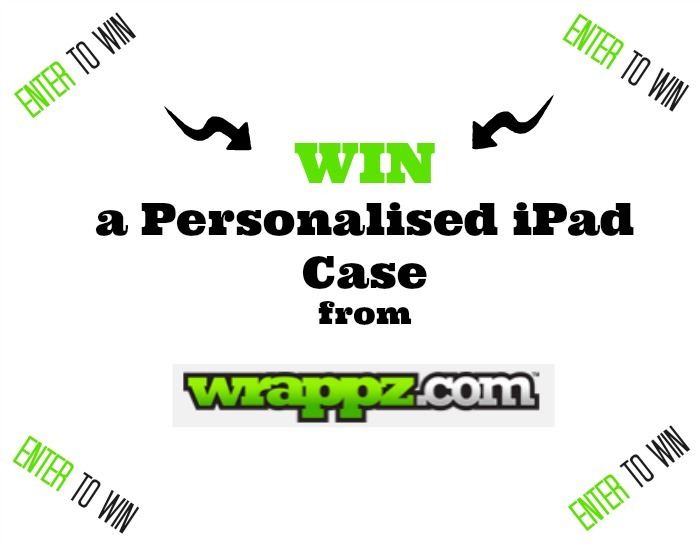 I am offering a chance to WIN your very own Personalised Wrappz iPad Case! Enter the contest below! If you don’t own an iPad, you are in luck, I also can offer to all my readers a FREE personalised phone skin when you visit Wrappz website and use the code FREESKIN (you just need to pay postage). Know someone who has a birthday coming up or need a Mother’s Day gift, enter for your chance to win, and while you are at it, grab yourself a FREE phone skin too. Thank you Tracey, I love doing collages. I even designed my own wedding album. I loved this so much I am going to design one from Wrappz for mr p and my mom for mother’s day too. They are so great. Thank you so much! I love personalising everything and collages are my all time favorite. Thanks Suzanne, I hope you at least got yourself a free skin for your phone. It’s so fun to persoanlise things. Thanks for stopping by and commenting. Hope to see you again soon. Thank you I really love mine. Click on the link and get yourself one! It’s super quick and easy. I think it’s really lovely, what a gorgeous design you put together. I wouldn’t have thought about using black and white. Thank you Sarah. I am a huge fan of black and white. I would have loved to decorate my entire house in black and white and have all my photos on the wall black and white too. lol But kids need color. Maybe when they are older I can redecorate. Either way I was really impressed with the outcome of this design!!! Thanks for stopping by and commenting. Hope to see you again soon. Thank you Claire. I was really impressed with how it turned out. The pictures are very clear and printed on high gloss. It looks better than it did when I ordered it. Hope you entered the giveaway. Always a good present for someone if you win! Or yourself of course. Thanks Emma. I hope you win then, while you are at it get yourself the FREE phone skin and I wish you best of luck in the giveaway. I love how much you can edit and play around with the design. So creative. 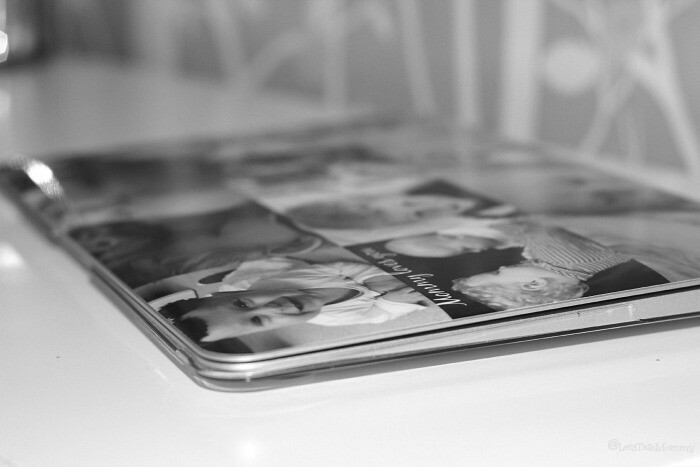 It looks awesome, I love the fact the pictures are in different angles. Thanks Monika. I do, I had just front on square pictures. They look more natural I think this way. I love a good collage especially in black and white. Thanks for stopping by and commenting. I hope to see you again soon. Thank you Emma. I love black and white collages so timeless. It’s so easy to do too with Wrappz amazing editting tools. Hope you grabbed yourself a FREE phone case. Thanks for stopping by and commenting. I hope to see you again soon. Thank you. I didn’t want just one picture on the back. Who can pick just one picture? So I opted to create a mini collage. The editing tools were great and let me make all different size squares and rectangles which most case companies don’t have that option. I was impressed. Hope you got yourself a free case. I am probably too obsessed with it to be honest. I would personalise anything and everything. hahaha It is a great way to cherish memories you are so right. I hope you took the chance to get yourself a free personalised phone case then and enter to win. If you don’t have an ipad they make a good present to give someone!!! Thanks Katie, I have been testing my photography skills out, yet again. lol It was fun to make a collage for the back instead of just one picture. Thanks hun, I really enjoyed making a black and white collage for it, as I always just do one picture and colored. It was a good change. I am loving it. Thank you so much Jo. I had fun creating the back collage. There was no way I could pick just one picture. Hope you entered to win my lovely and best, best of luck!!! Thank you so much for stopping by and commenting. Thanks Laura. Hope you got your entries in to win. I agree, lots to choose from. Thanks for stopping by and commenting. Hope to see you again soon. Thank you Rachael. They are so timeless aren’t they? I also love a good collage. No way could I have picked just one picture for the back. So cool that we can all get phone skins! You treat your readers so well! Love your Mac Book skin!!! Thank you Raimy. I was really impressed. I loved how it turned out glossy and the pictures printed were suburb. Hope you grabbed yourself a Free phone skin too. I love the case – super cute! Wrappz have great designs and the team are always really happy! Thank you Helen. Yes they do have great designs. I loved making my own collage version too. Their editing tools were great for that as most companies don’t allow you to tweak and move it around so much. Thanks for stopping by and commenting. HOpe to see you again soon. Thank you. Hope you grabbed yourself a free phone skin and entered to win! Best of luck! Thank you, I am a huge fan of black and white. I love a good collage too. Who can just pick one picture? I hope you grabbed yourself a free phone skin and entered to win! If you don’t have an ipad it would make a good present!! Thanks Pauline. So true. Hope you got your entries in to win. Would make a great pressie too! Your design is lovely, great for memories. I agree, I have always done color for my other covers on my phone or laptops but this time I was so pleased how great the black and white came out. Gorgeous! 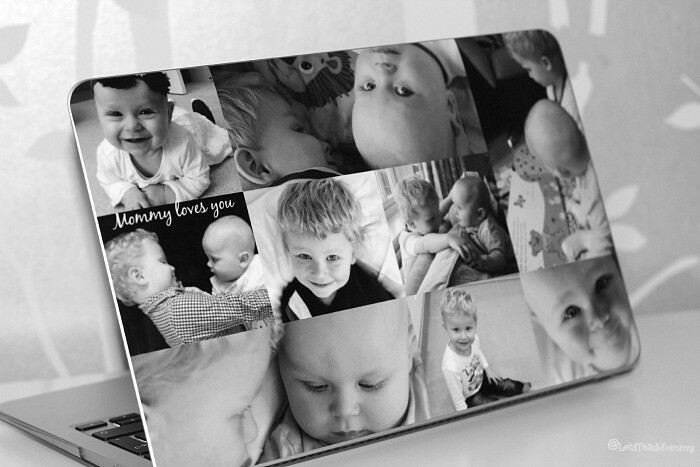 Love the look of your photos and the quality of the product. Stunning. Thank you Lisa so nice of you to say. Good luck to win your own canvas! Thank you. Yes, wrappz has great options. I was so pleased with it. I do just keeping looking at it! All my favorite pics together of my little sugar lumps. Thank you Rebekah. I love black and white collages. So timeless and stunning. Hope you got your entries in to win, not long now until the winner is announced. Thanks Emma. Hope you got your entries to win. Not long to go now until the winner is announced. A good way to penalize your case. These are such a great idea and great occasion presents too!! Yes, so true Holly. They would make a great present. Definitely great for the cat too! 😉 Good luck to win. Thank you Tracey. I just love how great it came out in the black and white. I hadn’t done a cover in black and white before. I think I will do a b&w one for my iphone too now. Good luck! Thank you Natalie, I hope you entered the drawing to win. Closes tomorrow night. Thank you. Good quality too. Good luck. Thank you Jennifer, can’t beat a thumbs up!!!! Hope you got your entries in to win, last few hours to go!!! Thank you so much Angie. Good luck to win your own ipad case!!! Makes a good present. Thanks Sue. Good luck to win, hope you got your entries in! Thank you Angie. Hope you got your entries in to win. Good luck. Thank you Julia. I thought it turned out great too! Was pleased with the black and white. I think it is lovely. would never have thought to add lots of different pictures. Joining them by the colour. Turned out really well. Thank you Holly. I couldn’t just pick one picture I have so many favorites so a collage worked well. Thanks Natalie. I am a huge fan of black and white photos and collages especially.